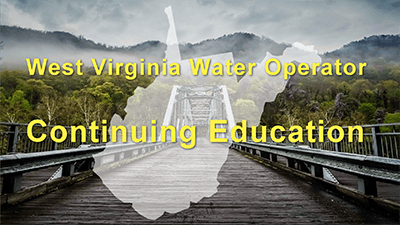 At AYPO Tech, we aim to both provide water operators in West Virginia with effective and practical training and help them complete the continuing education hours (CEH) they need in order to renew their license. These state-approved courses are designed to give water operators the training they need while also presenting information that is comprehensive and practical. What are the CE requirements for West Virginia water operators? Save on our 24 Hour CE Package. It includes: Surface Water, Source Water, Disinfection, Membrane, Water Distribution Overview, Pipelines, Storage Tank, Groundwater Wells, and Water Distribution Quality. Save on our 12 Hour CE Package. It includes: Surface Water (3 Hours), Coagulation (3 Hours), Sedimentation (3 Hours) and Corrosion (3 Hours). Save on our 6 Contact Hour CE Package. Includes: Surface Water Treatment (3 Hours) and Corrosion Control (3 Hours). This course will fulfill 4.5 of your required hours for West Virginia water operators. A hardcopy letter will follow shortly summarizing this information. Please let me know if you have any questions.